(It was actually recently covered in the Ottawa Citizen, which is proof of the stories credibility). Exact dates and years are not known to anyone, so I will use the ones that I know. Lisgar, if you don't know it, can be best described as a large, old, castle. 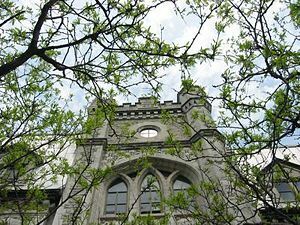 Located in downtown Ottawa, it's style is definitely neo-gothic. This story actually begins with the roof. The roof is heavily slanted and covered with sheet aluminum. Due to it's heavy incline, the snow will pile up quite heavily on top of of the roof, only when the weight of the snow gets too great will the snow come falling down. Even today with the heating coils installed at the base of the roof, an area of about 15 feet near to the school is fenced off in winter; just in case the snow would happen to fall. There is a reason for this. Apparently, some time during the early fourties (1941 or 42) there was a particularly heavy snowfall, followed by a heavy frost. This ensuing frost turned all the snow on the roof into tightly packed ice. One day the school's head-girl was walking by under the roof when a chunk of this ice came crashing down on top of her, killing her. This tragic incident forced the school to do something about the ice on the roof. The solution they came up with was the true cause of this haunting. The fourth floor of Lisgar is not so much a floor, but and attic. During Lisgar's early years it was actually used as a shooting range for the Lisgar Rifle Club and the Lisgar Cadet Corps. As there was no floor, they had to lie on wooden boards lain across the rafters. Apparently, (I have never been up there, it's locked now) there is a door at the far end of the fourth floor which opens up onto the roof. It was through this door, on that day in the early forties, that they sent all the schools janitors out on to the roof to shovel off all the snow. There was one particular janitor, the kids at that time called him the Asp. He was an older, cranky old gentleman, much like the antisocial stereotypical janitors you see portrayed in books and on TV. He was always on the student's case about cleaning up, and not making messes. He seemed to come out of nowhere, the students said, always ready to chastise them for something. The Asp was also sent out onto the roof on that day. Unfortunately, the sheer slope of the roof, combined with the icy surface underneath, caused the Asp to lose his footing, slipping, and falling to his death, 100 feet below. The first reports of the hauntings came not long after. Janitors who went up to the fourth floor felt the temperature drop as they walked by the old door to the roof. They often felt as if someone were watching them. And the night-shift janitors, while cleaning on the third floor, often heard strange noises coming from the fourth. Even today, many of the custodial staff try to avoid going up to the fourth floor, especially after the school is closed. Others will clearly attest to feeling a "presence" while up on the fourth floor. Witnesses have come by Lisgar at night, long after people have left and have reported seeing strange lights moving about in the fourth floor windows. Lisgar is included as a stop on the Ottawa Haunted Walks Tour and some there have witnessed these lights too. The Asp, however, doesn't seem to be a malevolent ghost, in fact it is speculated that he may in fact have helped out on several occasions. When the school was being renovated in the 1970s inspectors on the fourth floor found evidence of several electrical fires, in the walls, that had somehow put themselves out. While he was alive, one of the Asp's characteristics, was his will, and ability to always fix things, as quickly as possible, and whenever they needed fixing. Many have speculated that the ghost of the Asp, in a love for his school, put out these fires himself. So, that's the story, I have yet to see him myself, (I've been trying to get up to the fourth floor for ages anyway)... It's true, many believe it, I didn't make it up. That's about all.